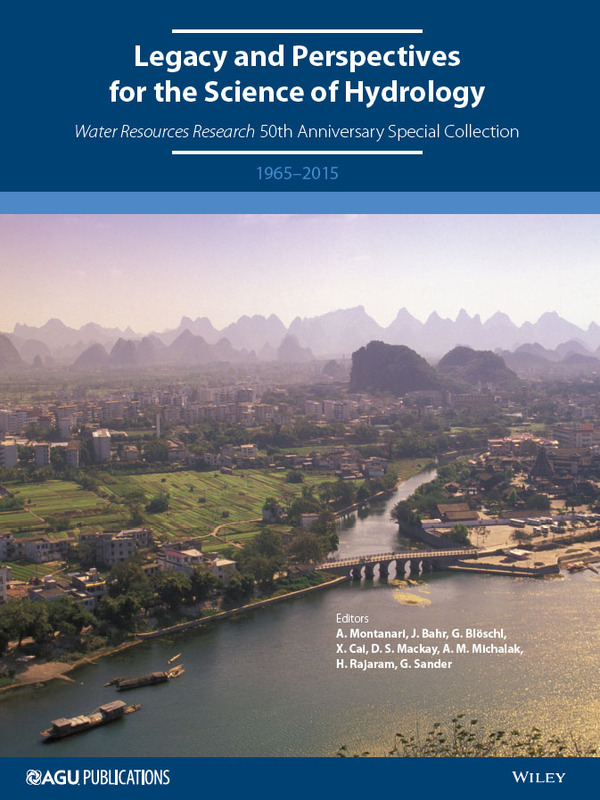 Marc Bierkens contributed the paper entitled “Global hydrology 2015: state, trends and directions” to the 50th anniversary of Water Resources Research special collection issue. The papers in this issue are freely downloadable! Inge de Graaf , PhD student in our group has published a paper about a global 6-arcminute one-layer groundwater model. The model is made in MODFLOW and is forced with recharge and surface water levels from our global hydrological model. In this publication a steady state global groundwater depth map has been made, but in subsequent work Inge will provide an updated 5-arcminute two-layer version and transient runs, including the effects of groundwater abstractions. De Graaf, I.E.M., E.H. Sutanudjaja, L.P.H. van Beek, and M.F.P. 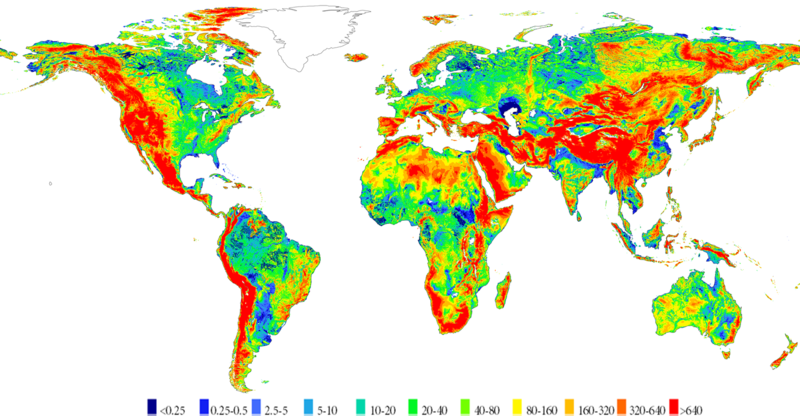 Bierkens, 2015. high-resolution global-scale groundwater model. Hydrology Earth System Science, 19, 823-837. The World Resources Institute has launced the Aqueduct Global Flood Analyzer v1.0. It the first-ever public analysis of current and future river-flood risks worldwide. 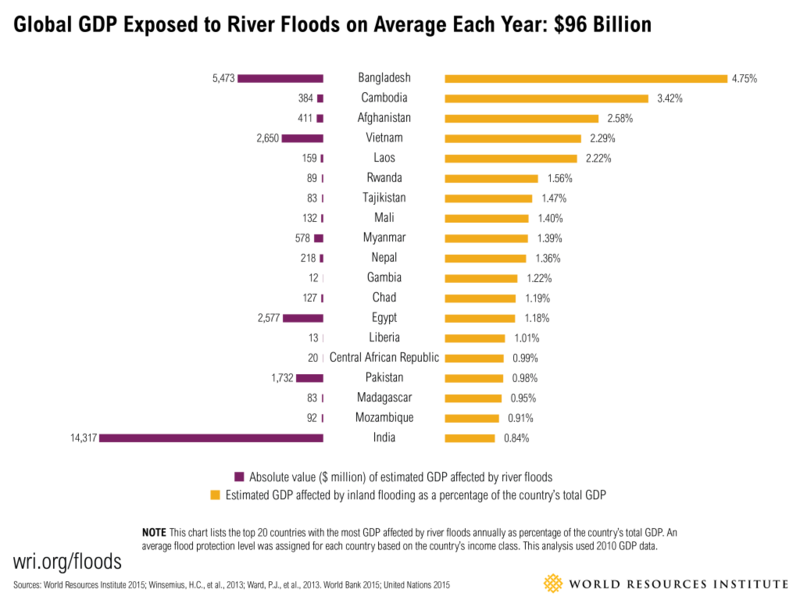 The Analyzer estimates current and 2030 values for potential exposed GDP, affected population and urban damage from river floods for every state, country, and major river basin in the world. The tool is based on a large number of runs with our global hydrological model PCR-GLOBWB from 1070-2030 using bias-corrected global climate models as inputs. These runs have been downscaled by Deltares and turned into flood risk (people and GDP affected) by IVM-VU University of Amsterdam, Utrecht University and the under different socio-economic scenarios made by PBL- Netherlands Environmental Assessment Agency. See the blog post at WRI for more information. River flooding could affect more people and cause significantly more damage by 2030, as climate change and socio-economic development accelerate. 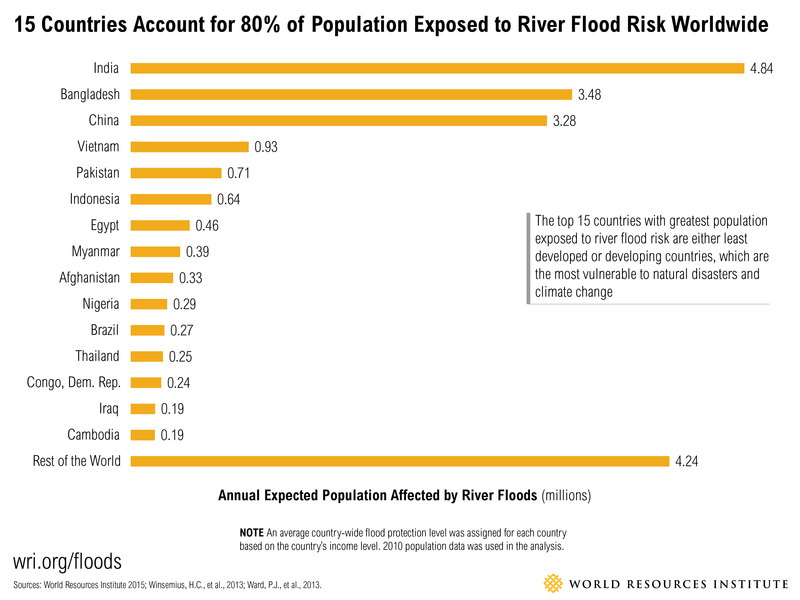 Today, river flooding affects 21 million people worldwide and exposes $96 billion in GDP on average each year. 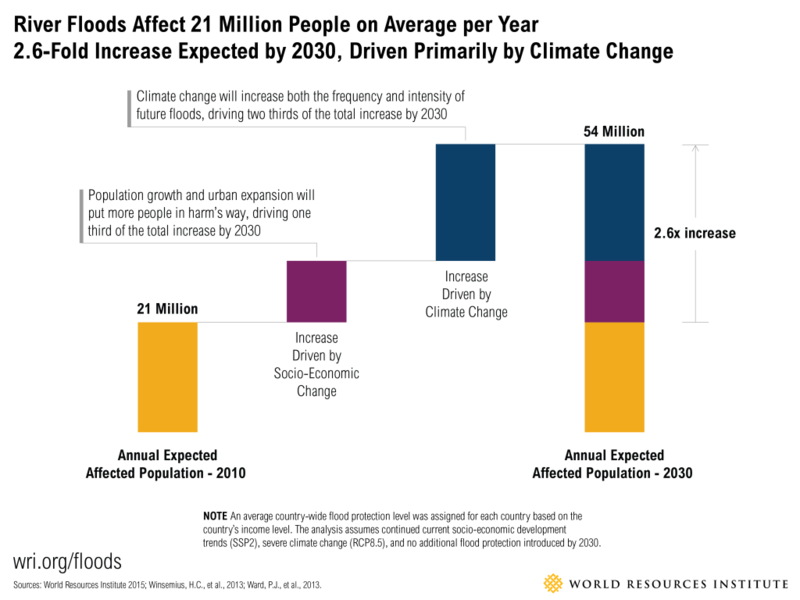 By 2030, those numbers could grow to 54 million people and $521 billion in GDP exposed every year. Top 11 countries (ranked by affected population) are India, Bangladesh, China, Vietnam, Pakistan, Indonesia, Egypt, Myanmar, Afghanistan, Nigeria and Brazil. See the publications supporting this research: Winsemius et al (2013) and Ward et al. (2014). The Roman World used trade of grain (actual virtual water trade) as a means to be more resilient against climate change. At the same time, as population grew as a result of a steady supply of food, it became more dependent on trade and thus more sensitive to political or climatological disturbances of the trade network. These are the main conclusions from a study by Brian Dermody and coworkers from the Netherlands and the US. Dermody, B. J., van Beek, R. P. H., Meeks, E., Klein Goldewijk, K., Scheidel, W., van der Velde, Y., Bierkens, M. F. P., Wassen, M. J., and Dekker, S. C.: A virtual water network of the Roman world, Hydrol. Earth Syst. Sci., 18, 5025-5040, doi:10.5194/hess-18-5025-2014, 2014. See the press release of EGU! It got quite some media attention. For instance in Smithsonian Magazine. Using a newly developed index and our group’s global hydrological model PCR-GLOBWB Yoshi Wada and Marc Bierkens assessed the amount of groundwater consumption coming from non-renewable sources as well as the amount of surface water consumption exceeding environmental flow limits. They calculated that this non-sustainable blue water use exceeds 30% of the current water consumption and that this number will rise to 40% towards the end of the 21st century. When combined with virtual water use, the index, called the blue water sustainability index (BlWSI), can also be used to assess which part of individual products is from sustainable water. Wada, Y. and M.F.P. Bierkens, 2014. Sustainability of global water use: past reconstruction and future projections. Environmental Research Letters 9, 104003 (17pp). Joost Delsman of Deltares, with contributions from our group, modelled the Holocene development of the fresh-salt groundwater distribution along a coastal transect in the Netherlands. To be able to understand and assess the current fresh-salt groundwater distribution and groundwater velocities one needs to go back a long time; this because of the large intertia of the system. Accurate predictions of the current fresh-salt groundwater distribution is essential for meaningful projections of salt water intrusion under scenarios of future sea-level change, climate change and groundwater abstractions. The reconstructed groundwater heads, chloride concentrations and groundwater origin matches very well with observations. A movie showing the Holocene development can be found here! J.R. Delsman, K.R.M. Hu-a-ng, P.C. Vos, P.G.B. de Louw, G.H.P. Oude Essink, P.J. Stuyfzand, and M.F.P. Bierkens, 2014.Paleo-modeling of coastal saltwater intrusion during the Holocene: an application to the Netherlands. Hydrology and Earth System Science 18, 3891-3905. Yoshihide Wada of the Earth Surface Hydrology group co-authored a commentary in Nature Geoscience, arguing that the wedge approach proposed for evaluating carbon mitigation policies is also suitable to evaluate policies to avoid future water stress. See the commentary at: Wada, T., T. Gleeson and L. Esnault, 2014. Wedge approach to water stress. Nature Geoscience 7, 615-617. See also the article in Space Daily! In addition to discharge observations, remotely sensed soil moisture estimates improve the calibration of large-scale hydrological models as shown by Niko Wanders in a recent publication in Water Resources Research. In this paper a dual state-parameter Ensemble Kalman Filter is used to calibrate the hydrological model LISFLOOD for the Upper Danube. Calibration is done using discharge and remotely sensed soil moisture acquired by AMSR-E, SMOS, and ASCAT. Wanders, N., M.F.P. Bierkens, S.M. Jong, A. Roo, and D. Karssenberg, 2014. The benefits of using remotely sensed soil moisture in parameter identification of large-scale hydrological models. Water Resources Research 50 (in press). E. Vannametee, L.V. Babel, M.R. Hendriks, J. Schuur, S.M. de Jong, M.F.P. Bierkens, D. Karssenberg, 2014. Semi-automated mapping of landforms using multiple point geostatistics. Geomorphology 221, 298-319. Siteur, K., M. B. Eppinga,, D. Karssenberg, M. Baudena, M. F. P. Bierkens, and M. Rietkerk, 2014. How will increases in rainfall intensity affect semiarid ecosystems? Water Resources Research 50, 5980–6001. Our group contributed to the report and policy note Understanding Risk: the Evolution of Disaster Risk Assessment issued by the GLOBAL FACILITY FOR DISASTER REDUCTION AND RECOVERY and paid for by World Bank. Our contribution, a case study (Bangladesh) and an example of the GLOFRIS framework, was lead by VU University in co-operation with Deltares and PBL. Download the report and the policy note here!